The Superaugmented Scale is a major scale with every note raised by a semitone except the 1 and 7: 1 #2 #3 #4 #5 #6 7. It came up a couple of times in the lines in my recent Scriabin-inspired post so I thought it might be worth digging deeper into. I'd be tempted to learn this in stages. First, notice four of the notes form a m7b5 arpeggio. Next, it's easy to add the major 7 directly between the b7 and the root. That's five of the seven notes. The other two are the 4 and the #5, which aren't too hard to find. My first thought on playing this scale is how "natural" it sounds, like something half-remembered, a bit like the Double Harmonic. It's almost as if it's not really a highly-altered scale at all. In fact, in terms of interval structure you could see it as a major scale with just two alterations (b1 and b7), which doesn't seem anywhere near as exotic and probably explains the half-familiar sound. The trouble is, flatting the 1 and 7 of a major scale yields a hypermode, not a proper scale. That's why I'm spelling it with sharps instead. Or perhaps it really is used in some folk tradition somewhere; I have no idea but if you've seen it "in the wild" I'd love to hear about it. 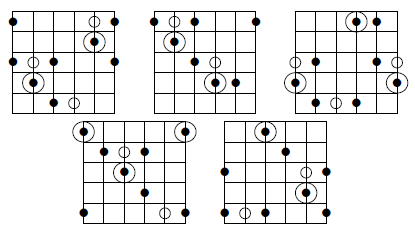 Anyway, next I'm interested in triads or seventh chords that "cover" the scale. This is because you don't want to get stuck running the scale up and down stepwise, and arpeggios provide an easy way to break lines up with bigger intervals. Let's do everything in the key of C.
To start with the obvious thing, we have Cm7b5, which is C Eb Gb Bb or, using sharps like the scale does, C D# F# A#. What's left is E# G# and B. This can be respelled F Ab Cb, which is an F diminished triad. Since D#=Eb is in the scale too, we can extend this to Fm7b5. So if we combine Cm7b5 with Fm7b5, we get the Superaugmented sound. Generalizing, interchange i7b5 and iv7b5. Incidentally, that sub -- playing the m7b5 up a fourth from where it "should" be -- is a nice move in a ii-V-i. For instance, try playing the A section of "What Is This Thing Called Love" like this: Cm7b5-C7alt-Fm7-Gm7b5-G7-CMaj7. You could think of this as replacing the ii with an altered version of the V (with the b7 and #9=b3) but this was is more fun I think. The other notes in the scale are D#, G# and B, which again can be respelled Ab Cb Eb, an Ab minor triad. Since we have F#=Gb also in the scale, we can upgrade this to an Abm7. On an extended ii-V-I, subbing these two chords for the ii is fun: so in Bb where we would usually have Cm7-F7-Bb we can now play F#Maj7b5-Abm7-Cm7b5-F7-Bb. More radically, Abm7-F#Maj7b5-Bb works to my ear (note the switched order). Let's do one more of these: the Maj7 built on the seventh degree, i.e. BMaj7 in C. This has the notes B D# F# A#, so the remaining notes are C E# G# = F Ab C, an F minor triad. Again, we can borrow the D# from the other chord to make it Fm7. These two have a much more static sound than the previous two; I don't hear them in a ii-V kind of setting unless you want a very suspended type of sound. But it does give us a very surprising sub for a Maj 7 chord: play the m7 a tritone away. This is just like doing a tritone sub with dominant chords, only the chord quality changes. This can, if you want, transform a major ii-V-I into a ii-V7-bV, which of course makes it sound retrospectively as if the V7 was a tritone sub itself! Weird and not something you want to do when comping unless you've discussed it beforehand or are keen to throw the soloist under a bus. But if you're the one soloing, it's an interesting sound. Also, try subbing "vertically" as well -- e.g. instead of Fm7b5 (first row) play F#Maj7b5 (second row). If they both sub for Cm7b5, they should sub for each other, right? By this last statement I don't mean "should" to imply there's some deep theory going on there. At this point this is just a paper exercise. It's meant to suggest things for you to try, to see whether you like them and want to build them into your playing. Only your ears can really tell you what works and what doesn't. Personally I'm liking these sounds, so there may be ore superaugmented stuff to come.